Mondale introducing @HillaryClinton "There is no one I trust more to sit in the Oval Office." Pro-Clinton crowd gives candidate standing ovation at start of hour late speech. Hillary Clinton says Mondale's support means much to her personally. She calls him a great American. Amy Klobuchar is also in attendance, sitting next to Franken. Clinton butters up crowd by calling Klobuchar, Franken a "dynamic duo" for Minnesota. OpenSecrets.org has fundraising profiles for all 535 members of Congress (and more). Clinton said we cannot give in to fear and cannot let fear push us into actions that make us less safe. Clinton: "We cannot give in to fear," must stay true to values. Clinton says San Bernardino shootings "felt different" than other domestic terrorism, made it feel it could be anywhere, anytime. 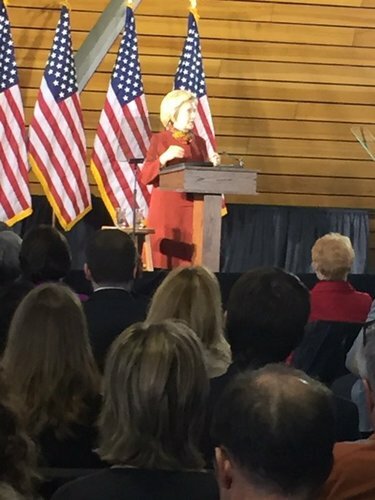 At U of M @HillaryClinton says "phrase 'active shooter' is not one we should have to teach our children"
Clinton says Twin Cities have seen first hand how communities come together to resist radicalization. Clinton met with local Somali community members before speech to discuss strategy. Clinton says we will "choose resolve over fear," and defeat ISIS. "We can't afford another major ground war in Middle East," says @HillaryClinton "That's what ISIS wants"
Clinton says we need a serious discussion, not "bluster and bigotry." Clinton says she wants to "discover and disrupt plots before they can be carried out." Clinton says terrorist social media chat rooms must be shut down and want nation's tech industry to help. Clinton says better intelligence sharing is needed to stop jihadists from training overseas and returning to US. "Slamming the door" on Syrian refugees not who we are as Americans, says Clinton. Clinton says we cannot slam door on refugees, "we're better than that." Time to restore ban on assault weapons, Clinton says to standing ovation. Clinton's pre-speech mtg with local Muslim ldrs. on efforts to "promote community development and resiliency, campaign says. Clinton says she wants to make it harder for domestic terrorists to get guns. Clinton says her anti-terrorism plan will support law enforcement "who risk their lives to prevent and respond to attacks." H. Clinton says Muslim Americans are "first last and best defense against homegrown radicalization and terrorism"
Clinton says Muslim-Americans are best defense to radicalization, praises local efforts. Clinton references Clark shooting in talking about need for police/community trust. Clinton says country must stand up to anti-Muslim rhetoric. Clinton says she heard in private meeting that many local Muslim children are afraid to go to school. Clinton finally mentions Trump, but adds that other GOP candidates have also said "divisive things." Clinton says "demonizing Muslims" helps terrorist recruiting. Taking swipe at @realDonaldTrump @HillaryClinton says in Mpls. that divisive rhetoric plays into hands of terrorists. Clinton: "Americans will not buckle or break or turn on each other."